Ticking the boxes — Paul Mickleburgh. Boiler plant with a large turndown ratio can respond to various challenges presented by commercial heating systems — especially heat networks. Paul Mickleburgh of Hamworthy Heating takes up the story. The recent ambitions to reduce carbon emissions and save energy are evident. The Government announced a new funding scheme to promote the use of low-carbon and recycled heat via district-heating schemes to reduce heating costs in October last year . According to estimates, this could reduce heating costs for home and businesses significantly. On a global scale, the Paris Agreement, aiming at keeping the average global temperature rise from pre-industrial times below 2 K by reducing carbon emissions, came into force a month later. What can be done in terms of heating-system design to accommodate more efficiency and less wasted energy? A significant contribution can be made by modular boilers with large turndown ratio and wide differential temperatures between the flow and return, which have been rising in popularity recently. When designing a commercial heating system it is essential to match both peak loads and low loads. But how do you match both demands without oversizing the plant and wasting energy? This is where a modular boiler system comes into play. In a typical modular boiler system, each boiler module could have a turndown ratio of 5 to 1, so a vertical stack of three modules will have 15 to 1 turndown. This provides a substantial range of outputs to match demand. For example, if one module has an output of 250 kW, then a vertical stack of would have 750 kW output. Because each module has a 5:1 turndown ratio, the overall system offers a seamless delivery of energy at any output from 50 up to 750 kW. This ensures the load is matched to warm the building up and that at low loads the boilers are not constantly cycling and wasting energy. This accurate load matching has become increasingly important when designing heat networks where boilers are used with renewables and combined heat and power (CHP). But why is this? Heat networks typically have diverse load requirements. From minimum summer loads, when mainly hot water requirements are being met with morning and evening spikes in demand, to winter loads when additional heating needs have to be met. 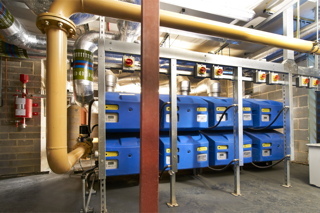 Stanmore Place in London is a mixed use development of houses, apartments and offices that in the first phase installed 34 Hamworthy condensing boiler modules across five plant rooms to provide a total output of 7900 kW for the different building’s heating and hot-water needs of the various buildings. When installing CHP, designers need to look at the minimum load very closely as the unit will be running continuously to meet the base-load heating requirements. The boilers will provide the top up to meet peaks in demand at different times. The minimum input from the boiler should match the base load covered by CHP but also cover the full load to ensure security of supply to the buildings in the heat network. During low-load conditions it is essential to have sufficient turndown within the boiler plant to accurately match the base load without wasteful cycling. But the boilers also need to be running in their most efficient state — at or near their minimum modulation, i.e. part-load. This maintains very high system operating efficiency, and the owner of the network can produce low-cost and low-carbon energy. System dynamics dictate how often boilers actually condense based on return-water temperature, which will reduce as system loads increase with more energy consumed from the circuit. A modular approach enables the increasing load to be met by more boilers operating at part-load conditions, which, if coinciding with favourable system temperatures, will allow high part-load condensing performance from the boiler plant. As system demands increase, boiler load will increase towards full capacity. At this point system return temperatures should be low, and the boilers will continue to operate in condensing condition, delivering an efficient energy supply. Boilers capable of operating with large differential temperatures can closely match system dynamics throughout the year. CIBSE Guidance ‘AM12 – Combined heat and power for buildings’ makes specific reference to designing district-heating schemes or heat networks with a minimum of 30 K differential temperature. This is to keep flow rates and pipe sizes small and also to maintain a low return temperature, even at low load conditions, for more efficient plant operation. The CIBSE/ADE ‘CP1 Heat networks: code of practice for the UK’ also refers to the use of lower return temperatures for best-practice heat-network design. These larger differential temperatures were originally only possible from large-water-content boilers but without the benefits of condensing capability, higher turndown ratios and accurate load matching that you get with a modular condensing boiler. But now modular condensing boilers with low water content are able to operate with wider differential temperatures, with some up to 40 K ∆T. This means you can maximise condensing operation and get energy and cost savings. Hamworthy modular condensing boilers were installed alongside a CHP engine and biomass boiler at The Movement project in Greenwich. They were installed by Vital Energi. Modular boilers and systems with wider temperature differentials also enable the supporting water pipes and pumps to be smaller — helping to reduce installation costs and gain further energy savings. Something I see a lot on projects is the phased approach to purchase and installation — in particular when constructing a new residential building or mixed-use development supplied by a heat network/energy centre. Often only parts of the building will be used when the complex is first opened — until the dwellings, offices or commercial units are sold or leased. With a modular boiler system there is no need to purchase and install all equipment straight away; the system can be added to or expanded as the building fills up. 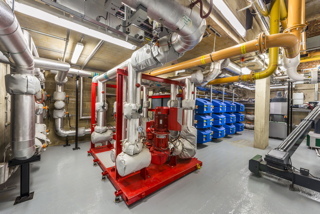 Alternatively, all the plant can be installed at the start, with only the boilers that are needed being use, switching them on incrementally building occupancy increases. This helps control costs and energy use. Our compact modular boilers, for example, fit through standard doorways, whereas large-output boilers take up more room and must be installed before the building is built around it. To help meet the Government’s energy-efficiency targets requires providing the right amount of heat at the right time, with little or no wastage. This means products working together to offer the best solution for each application. Modular boilers tick all the boxes for heat networks, energy centres as well as basement plant rooms, rooftop plant rooms and city centre developments. Paul Mickleburgh is Hamworthy Heating’s area sales manager for central London.